Pineapple is a fantastic fruit and a great source of vitamins. One cup of fresh pineapple chunks contain approximately 82 calories, 0 grams of fat, 0 grams of cholesterol, 2 milligrams of sodium, 22 grams of total carbohydrate (including 16 grams of sugar and 2.3 grams of fiber) and 1 gram of protein. Fresh pineapple is the only known source of an enzyme called bromelain, which has been used in studies to determine its effectiveness in alleviating joint pain, arthritis, reduce inflammation, inhibit tumor growth and shorten recovery time following plastic surgery.The bromelain content of the pineapple core and stem helps the body break down protein particles during digestion, encouraging overall digestive health. Bromelain also has anti-inflammatory, anti-clotting and natural detox properties. 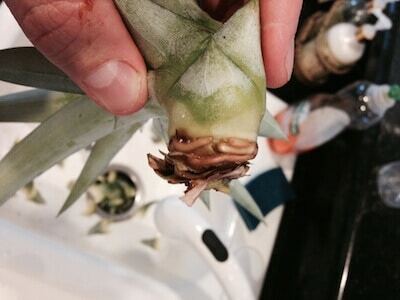 Did you know that you can grow your own pineapple from the crown of a pineapple you buy at the store? 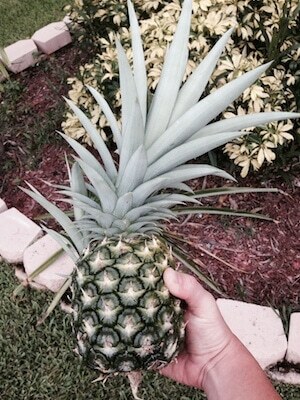 I have been growing my own pineapples for some time now and nothing beats having fresh organic fruit anytime you want and knowing exactly what went into growing it. 1. 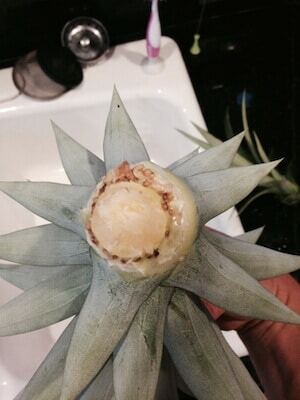 Buy an organic pineapple from your local farmers market or grocery store. 2. Grab the crown with one hand and the base with your other hand and twist them apart gently. 3. Once you have the crown off, strip off some of the lower leaves, exposing up to about an inch of the of the crown (the stalk will root but the leaves will rot). They come off in a spiral pattern so just remove, twist, and repeat. The small brown bumps below the leaf scars are root primordia (baby roots waiting to grow) and there may even be a few short roots at the base of the crown. Though these won’t be the roots that will grow in the next step, try not to damage these. 4. Place the crown in a clear glass of water and change out the water every few days. Place the crown away from any temperature extremes like heating or cooling vents and hot windows. On top of the refrigerator is where I put mine. In three weeks you’ll see healthy root growth. You’re now ready to plant the crown. 5. Once roots appear, plant the pineapple in a fast draining potting soil such as a Bromeliad or Cactus Potting Soil or directly into your organic garden. 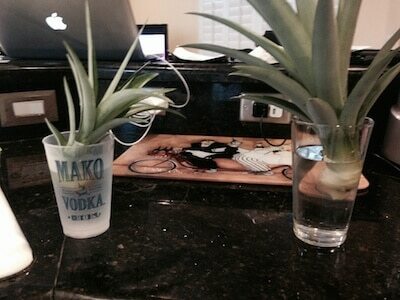 Here in South Florida we see the new plants doing very well in about 2 months!